The Fab 50 season has a few weeks left and the current standings, heading into the final month are below. Below are the top 10 in each age division. Note that the leading point scorer for each age division will earn MIG Youth Wrestler of The Year honors. 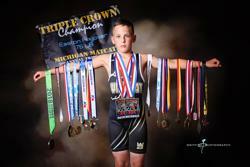 The overall current leader is Easton Fryover of Lakeview who has 105 points, highlighted by a MYWAY Regional title, Xmas Sparty title and 3rd place at the Mat Mayhem Nationals in Louisville KY.
Other current age group leaders heading into MYWAY States this weekend include: 6U Dillon McBride (Centerline), 10U Jaquan McMiller (Ruffin Trained), 12U Mikus Bishop (Silverback Academy), and 14U James Rivers (Michigan United). GET IN ON THE FAB 50! We are offering a last chance offer to get entered. Register by next Wednesday, April 3rd to be included in the Fab 50 Standings and Awards running. Click here to register for the Fab 50. No entries will be accepted after April 3rd.